Photo found in the Kate Harrison Friend papers, Accession #202, Box #2, Folder #9, The Texas Collection, Baylor University. Kate Harrison Friend was born in Boligee, Alabama in 1856, but following the death of her father, she and her mother moved to Waco, Texas, in 1885. Passionate about education, the two women opened a private school in their home. Friend worked as the editor of Artesia, Waco's society newspaper, and later as the Society Editor for the Waco Times-Herald. She started a Shakespeare class that developed into the Waco Shakespeare Club in 1899. The club became nationally recognized after one year of existence. Friend won a writing competition sponsored by the National Shakespeare Association and received a trip to Stratford-upon-Avon, after which she became an internationally recognized Shakespeare scholar. Friend cared deeply for animals and worked closely with the Waco Humane Society. Her efforts led to a grant that allowed the city to build the Waco Animal Shelter. 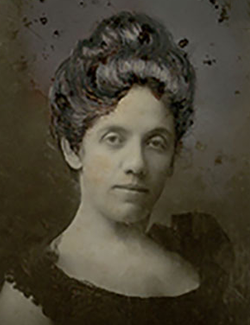 She remained concerned throughout her life about the treatment of women and children in the community and served in a board position for the Texas Federation of Women's Clubs from 1904 to 1936. Friend's work with parks in the Waco area influenced the donation of land from the William Cameron family for Cameron Park. She died on May 14, 1949. More information about Kate Harrison Friend can be found in the Kate Harrison Friend papers at The Texas Collection. Why Minor in Women's and Gender Studies?